Recently we took a few days’ trip to visit our eldest daughter and her partner who live in the North Thompson River valley, east of Kamloops, BC. With us was also our eldest granddaughter who was eager to see her aunt and was going to stay there for a few days longer than us. As always it’s a gorgeous drive by way of Coquihalla Highway, through high mountains and steep valleys. We had planned our return journey via the longer and slower route which we had not travelled in many years. Leaving the family, we first took the slow ranch country road along the north side of the North Thompson River (the main highway runs along the south side) only as far as Kamloops. 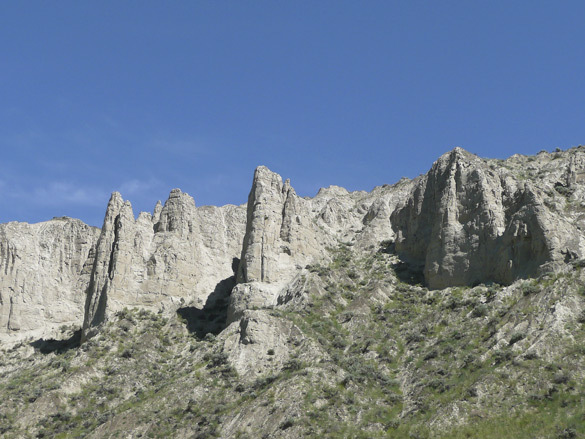 I was eager to get a closer look at the unusual rock formations along the north slopes of the mountain range straddling the river. I like to call these “pre-Hoodoos” because they are in early stages. 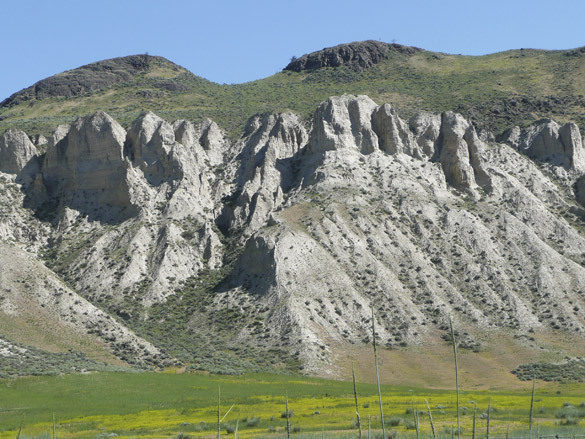 At home via the internet, I learned that further west yet nor far from Kamloops, there are true hoodoos – for next time! I’ve blogged several times about past trips to this area, but suggest just this one from a trip in summer 2010 which shows two more photos of the North Thompson River valley. More to come about the rest of the slow road home. Added 25th June: Tom’s comment below made me think that some of my newer readers (like Tom) likely haven’t delved deep into the almost 10 years of archives on this blog. I’ve written a fair bit about rock formations, petroglyphs and such related phenomena and how these have inspired my art work. 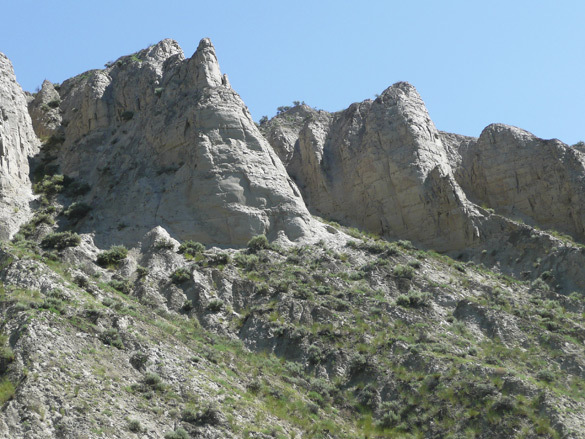 Hoodoos are one such so I have gathered together some links below to past posts about them, should they be of interest to some readers. I enjoyed the revisit myself! part 2, part 3, part 4, part 5, interlude, part 6 and the finale. These are gorgeous shots of the rock formations. Did you take them when you were stopped or from the moving car? I’ve only ever seen pictures of Hoodoos – the ones at Bryce Canyon (I think in Utah) are amazing. 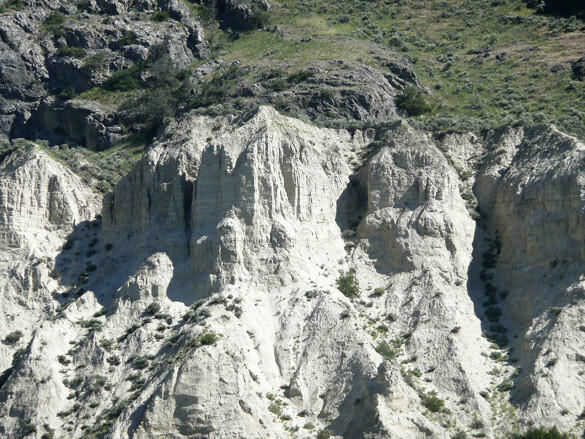 I have never come across the technical term ‘hoodoo’ for this geological structure. These pre-hoodoos really are quite fascination, and it will no doubt be a long time before they become full-blown ‘fairy chimneys’. We will not hold our breathe, will we? Just stand and admire. Susan, the only fully formed (de-formed sounds more like it) Hoodoos I have seen in person are the ones in Alberta, near Drumheller and at Writing-on-Stone Park. I’ve long admired photos of the ones in the US midwest. As a child I watched a TV show at a friend’s place called “Horse Opera” which was all about cowboys and Indians chasing each other around those amazing rock pillars and canyons. Oh, about taking the photos from a moving car…yes, at first, but then I had my husband stop at the best spots whenever possible on this narrow country road. I’m glad I did for those photos are better. Another reason to call this the ‘slow road home’. Tom, I doubt that Hoodoos is the ‘technical’ term. I like the playfulness of ‘Fairy chimneys’, new to me. Hold our breath and admire – yes! 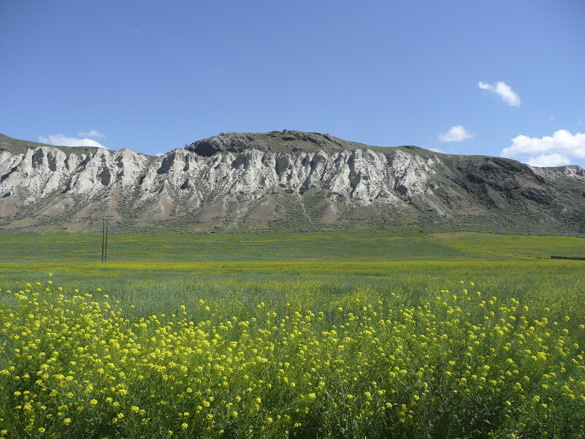 I think I’ll gather together some links about my past posts on Hoodoos for newer readers like you, Tom and maybe Susan too. Thank you so much for adding the addendum links, Marja-Leena. I’ve been here a while looking through all of them and can really understand your strong attachment to Writing-On-Stone Provincial Park. You’re right that it’s strange that Alberta hadn’t provided quite the facilities you expected but you did manage to collect a wonderful group of pictures. Thank goodness oil was never found under them. I hope one day you’ll be able to return. Susan, I’m glad you enjoyed the links. I could not remember if you were a visistor and commenter that long ago. Yes, I hope to visit this site again, especailly the part that required a guide to take one in. What a strange and beautiful countryside. There are so many things to see in this world, aren’t there. I’m happy to see these photos and imagine I might visit the Thompson River area some day. I wonder who lived there before Europeans came and what they were like. Hattie, this province has such a wide variety of climates and types of geography that it never gets boring. The native poeples populated much of it and are still here. Their culture is a rich one and I’m pleased to learn is experiencing a revival – I will be writing more about that in a future post, still about this trip.